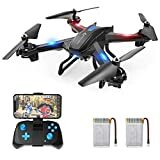 JXD 509G Drone Review 2019 – is the JXD 509G quadcopter worth the money? Review of features, pricing, flight duration, battery, camera and more. Drone technology has dramatically advanced over the years. You are now able to capture quality pictures and videos of inaccessible areas without any problem. The JXD 509G Drone is a top model drone available at an affordable price. The different capabilities of this drone allow you to use it in different fields. With its quality camera and capability to fly in high altitudes, you get an aerial view with a push of a button. The JXD 509G Drone allows you to monitor inaccessible areas with the push of a button. Because the controller can be unattached to the drone, you get to fly the drone far. 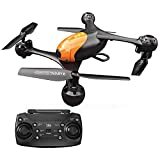 This drone has gained popularity because of its versatility. As a top model drone, it can be used for geographic mapping, crop monitoring, journalism, safety inspection, as well as disaster management. The elongated and sleek design adapted for this drone makes it easy to fly. JXD 509G is less bulky, allowing it to move through the air easily. It is protected against collision and crash landing due to the high-quality material used to fabricate it. The durable and long-lasting body has a solid feel and is designed to bend on collisions so that components don’t break. Incorporation of the FPV screen and the hood blocks out sun glare. The aerodynamic design, as well as the symmetrically placed propellers, give this drone a rectangular configuration. These give JXD 509G additional flight capability by boosting forward acceleration. The propeller units are close to the periphery, providing the drone with more stability during flight. The ability to fly high altitudes has been enabled by the altitude hold made possible by the inbuilt barometer. The camera is mounted at the front of the drone, allowing you to capture real-time videos and images. This quadcopter is powered by a 3.7v 600mAh Li-Po battery that takes one hour to charge. JXD 509G has a 9-10 minute flight time that allows you to capture images and live videos with the high-resolution camera. You can transmit live videos as you fly the drone. It comes with an on/off switch that allows you to turn it on or off without opening the battery cover. The batter supports the powered LED lights, and they allow you to fly this drone at night. The JXD 509G Drone comes with a 2 MP camera with a 720p resolution that allows you to capture quality pictures and videos. You can get an aerial view of inaccessible areas. The LCD screen displays quality live videos as well as mid-flight images. This drone’s camera is calibrated to be able to zoom in and out as you fly it. 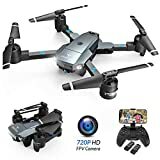 Because the camera has been placed at the front of the drone, you always get a clear line of sight to capture exceptional still and motion pictures. The camera can also achieve a 20 degrees tilt that enables you to capture images at different angles. It’s even possible to capture the image of a moving object with ease. JXD 509G comes with a 4 GB micro SD that allows you to store images and videos you capture. This drone’s 5.8 GHz controller comes with a video monitor and a phone clip choice. The monitor is perfectly synchronized with the camera for excellent performance and capturing os sharper images. The directional controller enables reliable feedback from the drone even when it’s flown far away. For optimum performance, you should do responsive checks and properly calibrate the controller. This simple controller is easy to operate, making flying of this drone easy to learn. You can choose to bind the controller to the drone or no, depending on how you’d like to fly it. The controller can achieve smooth liftoffs, three rate modes, and headless mode with the help of the joystick. JXD 509G allows you to achieve excellent flight performance even at high altitudes. The onboard barometer allows this smart drone to maintain altitude for stable flight. The 6-axis gyros work hand in hand with the altitude hold for excellent flight. The aerodynamic body design allows this drone to move through air freely. The JXD 509G Drone has exceptional flight performance when you properly calibrate it and make the necessary adjustments. 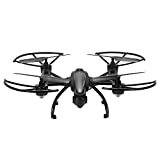 The aerodynamic design of this drone allows you to achieve optimum overall performance. This drone has been designed to fulfill aesthetic as well as functional purposes. The body of the drone is durable and is designed to be on collision to minimize the impact. When you compare JXD 509G to JXD 509W, you realize that they are quite similar when it comes to flight performance and altitude hold. However, JXD 509W exhibits latency lag which affects the quality of videos it captures while JXD 509G has excellent quality videos. 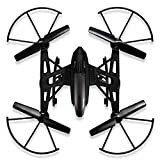 The JXD 509G Drone can also achieve aerial acrobatics that you cannot achieve with JXD 509W. JXD 509G has altitude hold that enables stable flight. The easy to operate controller allows you to learn how to fly this drone fast. The batteries charge for only one hour and provide 10 minutes flight time. The drone can be flown in areas with strong winds without a problem. It has a quality build and its videos are excellent.